Starting in Zimbra Collaboration 8.7, Zimbra uses repositories for 3rd party packages, in the first step towards having the whole product fully installable from repositories. Many Customers do not allow Internet access from their servers to the Internet, which means Zimbra's 8.7 installer will not be able to reach the Zimbra repository and be able to finish the Installation. 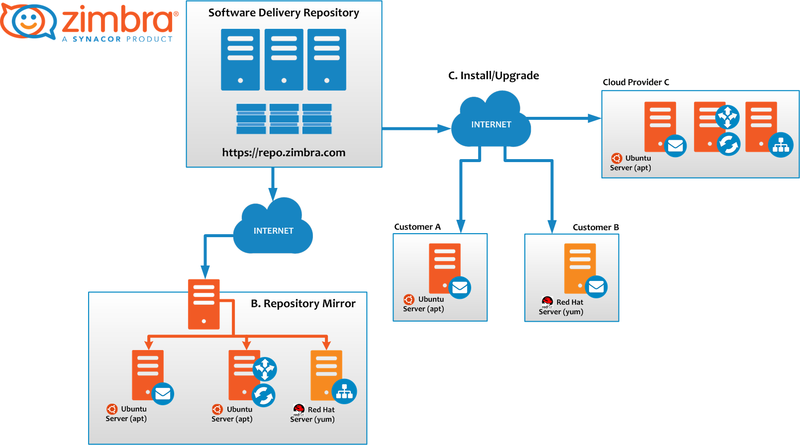 In order to successfully install Zimbra 8.7 within such a network, this Wiki will cover all the steps needed to create a local Zimbra mirror where a Company can clone our repo to a mirror, and the rest of the internal servers will take the needed packages locally from the mirror server. Section B in the image above is an example of this type of layout. Last but not least, download the Zimbra Collaboration 8.7 package and run the ./install.sh as usual. The installation will continue as usual, and will finish properly.